Steven Bracher had three viable pipe bombs and was working on a total of 17 improvised devices in Bishops Tawton. A man with extreme homophobic and racist views has admitted making a nine kilogram fertiliser bomb at his home in a Devon village. Steven Bracher had three viable pipe bombs and was working on a total of 17 improvised devices when he was arrested for having a knife in the street in Barnstaple. 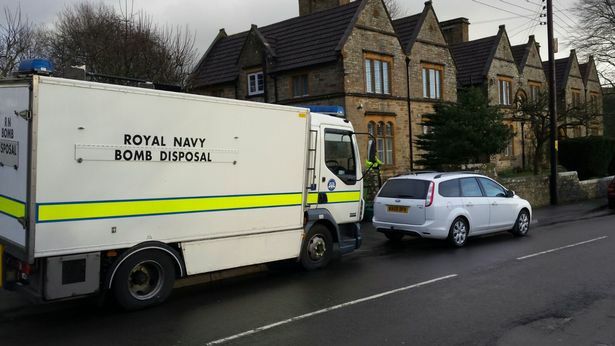 Royal Navy explosives experts spent several hours making safe and removing a large quantity of different chemicals at the historic Almshouses in Bishops Tawton, near Barnstaple. Police also found jottings which indicated extreme views of members of society including black people and gay people, some of which talked about killing people. The largest bomb was a nine kilogram device made from ammonium sulphate and diesel oil which was found under 55-year-old Bracher’s bed. It was blown up by the Plymouth-based Navy experts and the resulting explosion was filmed as evidence of the power of the bomb. It left a large hole in the ground. Scientists at a Government laboratory are still studying all the chemicals which were seized to try to find out whether Bracher was trying to make more devices. He is an amphetamine addict who was also trying to make his own supply in an operation similar to the one in the American crime series Breaking Bad. Bracher, of the Law Memorial Houses in Bishops Tawton, admitted three counts of having explosive substances, one of possessing a lock knife in Barnstaple High Street, and one of possessing amphetamines. He appeared by video link at Exeter Crown Court from Long Lartin prison and was remanded in custody. Judge David Evans ordered psychiatric and probation reports and adjourned the case until June 8. Mr David Sapiecha, prosecuting, said the explosives were found after Bracher was arrested on Wednesday January 24 this year. He said:”He was in possession of 17 improvised explosive devices. Three were what are commonly termed pipe bombs with explosives in metal tubes. “In addition there was an ammonia sulphate fertiliser bomb weighing nine kilograms. Video footage is available of it being exploded under controlled conditions which show the size of the blast and the hole it made. “The nine kilogram bomb was under his bed. There are aspects of the case that we do not link directly, but he had particular views which appear to be of concern. “The property was full of weaponry including machetes, knives and things like that. There were jottings which show fairly nasty views with regard to sections of society. “Drugs were being used. He told police he was addicted to amphetamines and had attempted to make amphetamine or met-amphetamine, although the experts say he was not up to it. “When he was booked into custody he said he had undiagnosed depression. He had an interest in explosives and one aspect which will need to be looked at is what may have happened if he had a bad day as a result of depression and drugs. Mr Richard Crabb, defending, said Bracher has no psychiatric history and there is another side to his character. He said there was no indication he had any intention to harm anyone or to damage property. The judge said:”He is expressing views in the jottings which are troubling and at the same location there are explosive substances and weaponry. The jottings include expressions of an intention to kill people.